A few days the Welsh Government confirmed that BT has been awarded the final phase two BDUK contract. The contract announcement talked a lot about faster broadband with 10,000 premises to benefit using £9.2 million of public funding completed by March 2021 and builds on a previous announcement in 2018 where 16,000 premises would see their speeds improve. Our understanding of this latest contract is the 10,000 will be pretty much all FTTP (full fibre) and the previous areas announced will be mostly FTTP based too. The combined 26,000 is around 1.8% of the premises in Wales, so once delivered Wales should be close to 96.4% superfast coverage. The original phase two contract news as we understood it was aiming for a much larger number of premises to be covered but it appears that due to the time constraints a larger footprint was not possible. So while the will and money may be there it looks like resources to deliver were the most likely constraint and with the volume of full fibre roll-out from numerous players in the next few years this is going to be a recurring theme. For those that missed out, there is the two Welsh voucher schemes (ABC and ultrafast connectivity scheme) and of course the broadband universal service obligation will of course be available in 2020. It is possible that there may be further contracts awarded or small extensions to these new contracts. 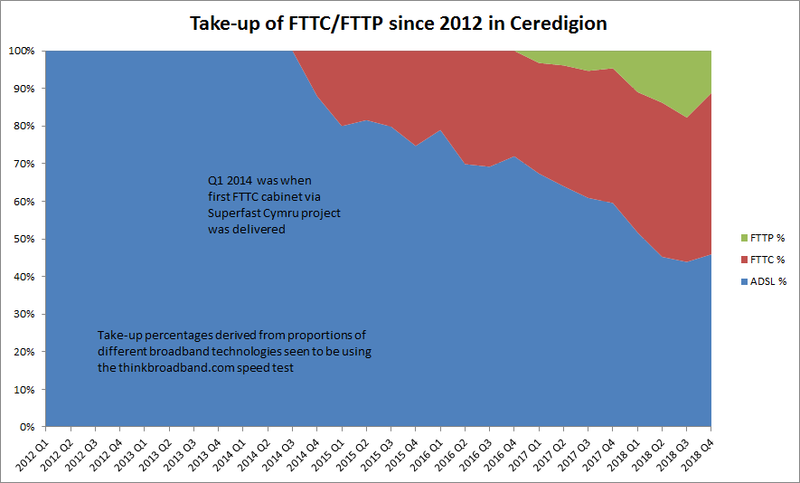 Ceredigion is an area of Wales that benefited a lot from the phase one Superfast Cymru contract but is still well below the UK average level of superfast coverage at 79.3%, but does have a good level of FTTP coverage at 18.9%. The chart below shows the pattern of different technologies we are seeing in the council area since we started tracking all this in 2012. What is interesting is the median speeds for the different technologies, ADSL/ADSL2 manages just 3.6 Mbps down (0.6 Mbps up), VDSL2 improves to 35.6 Mbps (7.4 Mbps up) and FTTP leads the pack at 51.3 Mbps (12.5 Mbps up). While many people do buy the slower FTTP services (40/55/80 speeds) the difference that using a technology with no distance drop off is readily apparent. The small reduction in FTTP users seen in Q4 2018 is part of the noise we see when using crowd sourced data, but also may reflect that there has been almost no construction in the council area for some time and thus those ready to bite your hand off for better broadband have upgraded and taken their new service for a test drive but as everything is working perfectly we may not see them again for some time. I'm in Ceredigion, but have a slow 2.5 Mbps ADSL connection on an Exchange Only line (although that's faster than some - and at least we've recently been upgraded to ADSL2+). Sadly though we're not included in this final phase of upgrades (neither is anyone else I personally know in Ceredigion who are still waiting). Being in a small hamlet (<= approx 30 premises) doesn't help matters, as villages either side have been upgraded to FTTC - resulting in "fragmented" pockets of slower broadband, less viable for community schemes. 4G is our best bet for the forseeable future. Can you not get a community thing going? I'm looking into options for community scheme - Community Fibre, Fixed Wireless via a local WISP, or TV Whitespace seem to be the best options to explore - but there isn't much demand here so far, with 30 or so households all on 4km+ EO lines, and not all interested (elderly or cost-concious), it will be difficult (most suppliers need min of 10 or 20 households signing up). But I will investigate options. In the meantime, I load balance my 2.5Mbps ADSL link with 4G (EE only available, am experimenting to see if I can get Three, but not hopeful) - and this is quite successful. Andrew, All these take up graphs could be improved by putting the scale on the right so we could see where the latest % was. Your 'Previous announcement in 2018' link gives a 404 error. Every little helps to push the numbers up and the fact that they are all FTTP future proofs those premises, I look forward to seeing where these are going to be. Fixed the 404, CMS mangled the URL for me. Will see about adding a rhs scale next time or adding grid lines. How do I find out if my address is included in this 10,000. I live in Powys and can see the exchange from my house!